If like me your have naturally quite curly and frizzy hair then summer in the city is not your friend. 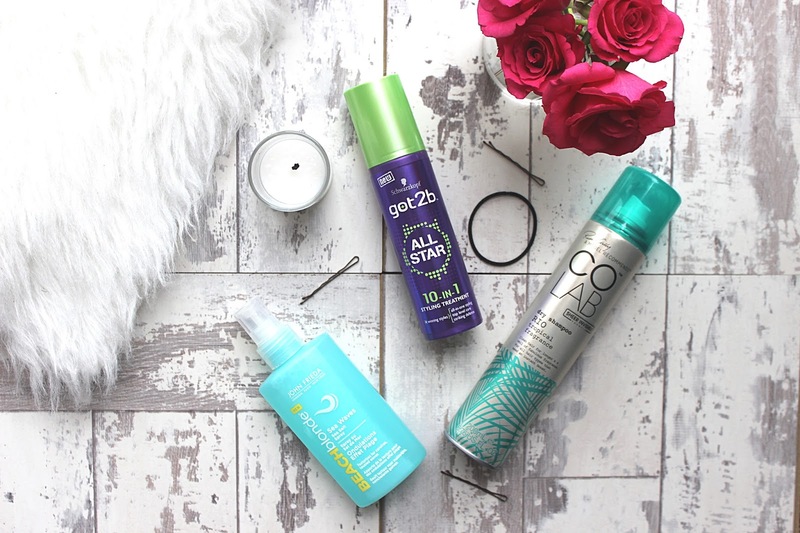 I mentioned the Got 2 Be All Star 10 in 1 product in this post but since the temperatures have been rising in London I've really been putting it to the test. I've found that if I apply a small amount of product through my hair before blow drying it gives my hair volume and somehow doesn't go frizzy with humidity. For giving natural beachy waves I've been using the John Frieda Beach Blonde Sea Salt Spray. It smells like summer in a bottle and gives really natural waves. When I go away this summer I'll be taking this product to use on days that I want my hair to dry naturally and have natural waves without too much styling. For keeping my hair fresh between washes Colab Dry Shampoo has been my favourite discovery of the year and the scent Rio is so summery and fresh. What I love about the Colab dry shampoo's is that they don't leave any white powder on your hair like others do but still leave your hair looking fresh. Do you have any hair products you specifically use in the summer?